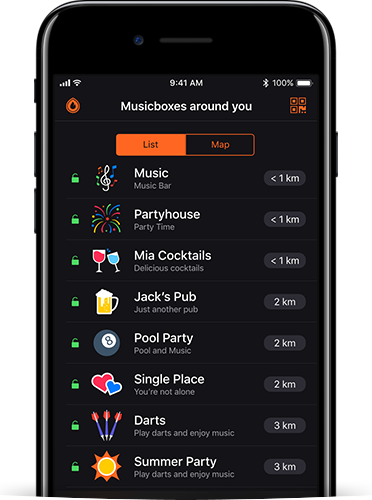 Patron - Support ongoing development and spread of mubo. Let's change the way we listen to music together! mubo is free to use for everyone. Of course it is a lot of work to develop the whole mubo system. If you would like to support us, you can become a mubo patron. The purchase is a way to directly support ongoing development and spread of mubo. You would like to support us? Our goal is to constantly develop mubo and that mubo is used in as many locations as possible. We still have a lot of ideas for mubo and we want to work even more on the spread. Your support make it possible to achieve these goals. Votes from a patron are displayed in a special way. We are grateful for any support. 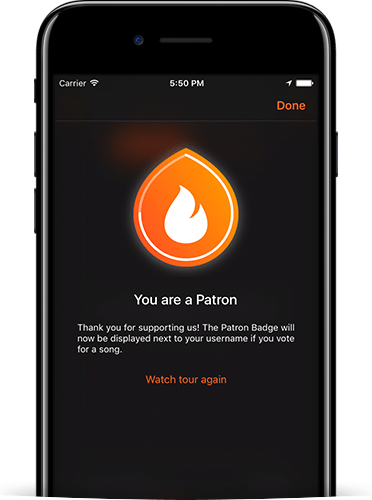 You can easily become a patron unsing the mubo app. Just tap on the patron button in the start view of the app. Then the view opens, where you can find the patron purchase. As a small acknowledgment for your support, your votes as patron will be represented differently.